You know the way the supermarkets do special deals on veg? Well, this led to there being an inordinate amount of broccoli in our house during the week, which in turn led me to googling recipes involving broccoli that would mean that I wouldn’t have to go to the shop to buy extra ingredients. I found a recipe here that I used, good old BBC Good Food. The dish was delicious, a great one to maybe make in the morning and reheat later, and the blurb on the website recommends it for freezing, but I haven’t tried myself yet. I added pancetta as it was in the fridge. The same base recipe could be used with any veg that you saute first, I’d like mushrooms or courgettes I think. I used cheddar cheese as that’s what was to hand, but again off you go with whatever type you’d like too. AND if you or your children don’t like vegetables this recipe makes a delicious macaroni and cheese. Comfort food on a plate, and full of broccoli goodness, it was a hit at the dinner table, although our resident two and a half year old broccoli hater pronounced “no me eat the broc-broc” and picked out every little bit, and then started swiping pancetta from everyone else’s plates. But milk, garlic and bay leaves in a small saucepan, bring to the boil and then remove from heat but don’t remove anything yet. Fry your pancetta on a non stick pan til crispy and put to one side. Check the pasta pack and time it to cook “al dente” (with a bit of bite left)- use a big saucepan as you’ll be adding the broccoli later -with 2 mins left of cooking time lob the broccoli in to the saucepan. When the timer goes off drain it into a colander. Strain the warm milk into a jug, picking out the garlic and bay leaves. Melt the butter in the pan until foaming then stir in the flour for 1 minute. Add the milk in a little at a time, stirring or whisking constantly to remove any lumps but be careful as I covered my hob in milk by whisking too much. Leave to simmer for about 2 mins, stirring constantly until you have a thick, lump-free sauce. Then take it off the heat and add the nutmeg, mustard, parsley and three-quarters of the cheese, add salt and pepper to taste. Add the pancetta to the pasta and broccoli and then mix them together with the cheese sauce. You can do this in the serving dish or in the saucepan you cooked them in. Washing up limitation wise I find it easier to do in the lasagne dish. When it’s all mixed together nicely and transfer to your lasagne dish, sprinkle over the remaining cheese. (If freezing, freeze now). Heat your grill to high and place the dish under the grill for the cheese to brown. Enjoy! 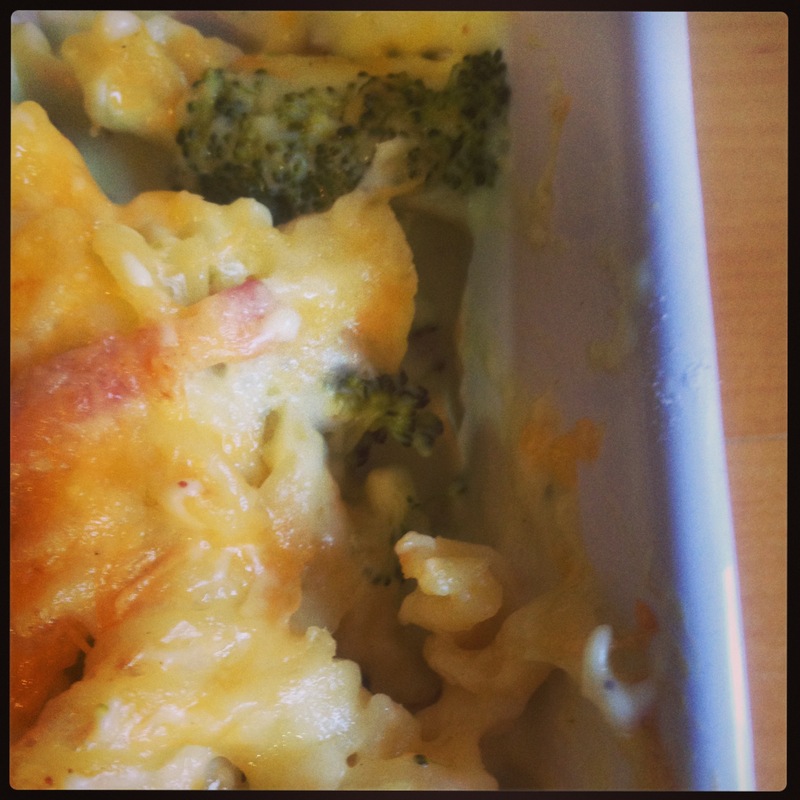 broccoli, creamy sauce, dinner, freezer friendly, macaroni cheese, make ahead dinners, pancetta, recipe. Bookmark.